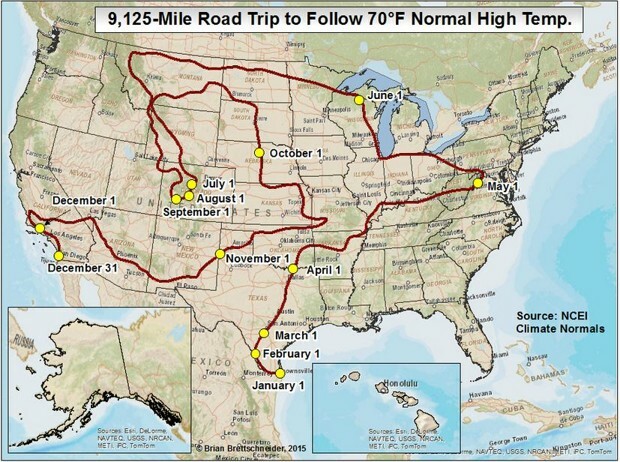 For those who have a hankerin’ as well as the time and money to venture out on a year long trike journey HERE is a plan where you can continually ride in 70 degree temperatures. These maps are found on the website I linked to above. I invite you to visit it and read thru what the author has written there. HERE is an article telling about the author of this planned road trip and how he came up with this. 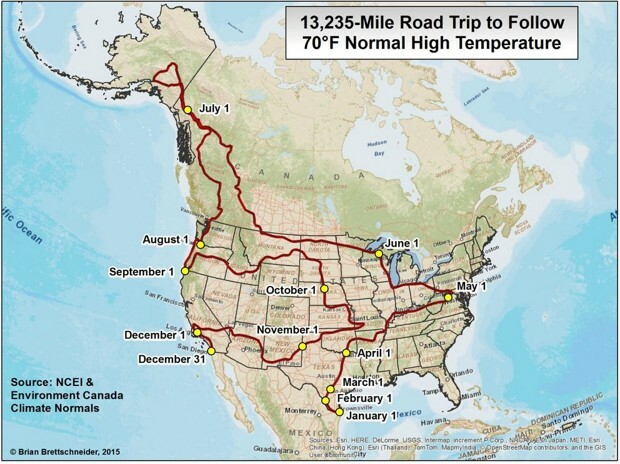 And here is a shorter ride route planned out all in the lower 48 states. I noticed that both of these planned routes go right thru the Chicago area. There is no way I would consider riding my tadpole trike there. Driving a car thru there is bad enough. I would not even do that. In my younger years I went into Chicago many times out of necessity … and hated going there, but there is no way I would do it now that I am older and ‘don’t have to’. Pittsburgh, Los Angeles, San Diego are other large cities this route goes thru. I am sure that there are others. I guess being a “small town boy” I just don’t like dealing with cities. I would much prefer avoiding them and riding thru rural and small towns the entire time. 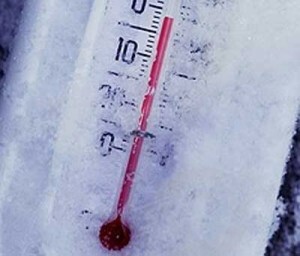 Here is an animated map showing the localities in the U.S. where one can expect to find 70 degree weather as the year goes along. 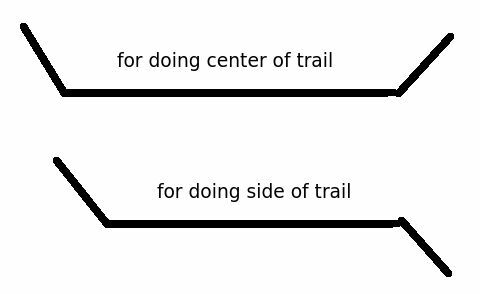 Perhaps you could plan a different route based on what is shown here. He simply pulls it behind his tadpole trike and with it can get more work done in one day than he could accomplish walking in an entire week. Like many projects if he were to make it again he would make some changes. Never the less, what he has now does a pretty decent job. 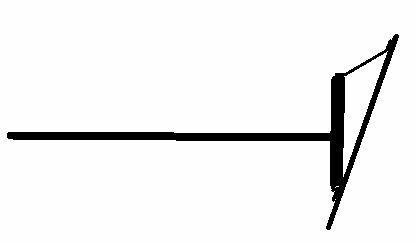 My thinking on the design is that the side piece should be angled out instead of at a 90 degree angle. Also I think there should be a side piece on the other side which can be easily and quickly removed and switched like I show in this drawing I made. He had swept the trail the day before so there are not a whole lot of leaves on it as he was sweeping it this day I took these pictures. When the leaves accumulate ahead of his rig he has to stop and pick up the rig and set it over to the side. 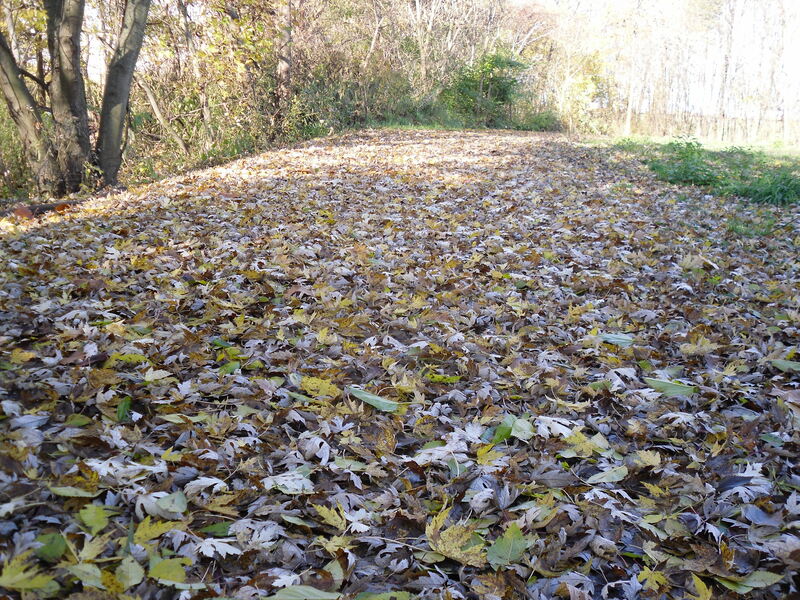 Then he takes a leaf rake he has along with him and rakes the accumulated leaves over off to the side of the trail. P.S. – After watching how his rig works and what is involved in using it I gave some thought as to how to make one for myself to use. I think that an angled plow type unit would work better so that the leaves roll off to the side of the plow unloading itself and eliminating the need to stop and get off like my friend is doing. Update – I made my own leaf removal rig today, but I will have to wait to try it out and see how it works. It has been raining and the eleaves are quite wet. Here is a drawing I made of what I came up with. Update: My design works great … far better than my friends. With my friend’s leaf removal rig the load of leaves he pulls behind him keeps growing and getting heavier and heavier wearing him out trying to pedal. 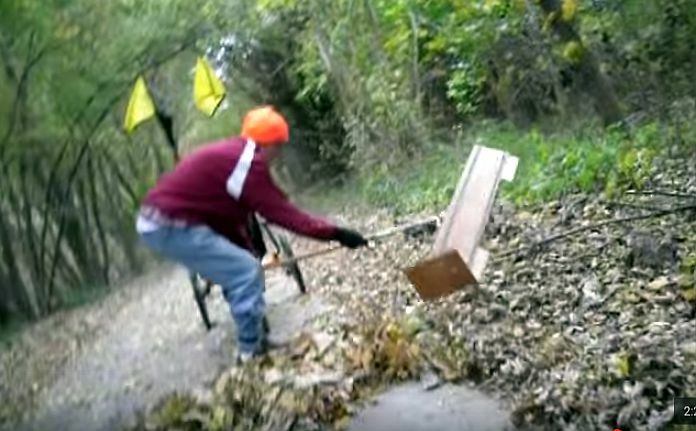 If he doesn’t stop to unload his rig it will unload itself leaving a big pile of leaves right on the trail which then needs to be removed. It is a real pain to use in my opinion. My outfit is so much simpler, better and faster. 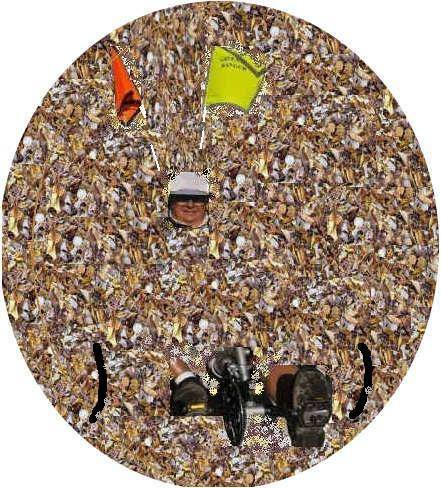 I just keep riding and the leaves unload themselves off to the side. It leaves a pretty clean trail and this was even after removing wet leaves which is a lot more difficult and challenging than dry leaves. If I were to do it over I would make it a little different though as I have learned from this one. I would add a second board and put weight in between the two boards to help hold it down. Right now I am hanging hand weights to both the front and the back side of the board. Of course, the weights on the front side are obstructing the leaf flow. 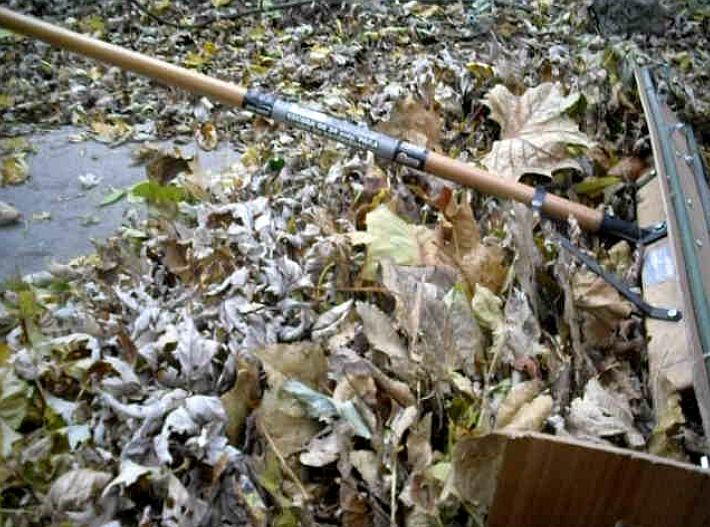 Also I think I would eliminate the broom altogether and have the pull be from the top of the boards so that there is no obstruction of any kind to the flow of leaves as they move over to the side and off load. Placing the weight on the back side of the one board I am using now results in tipping the rig over backwards so now I have to have weight on at least the front side to prevent this. It needs more weight so I am using the back side too, but I can’t put as much weight on the back side as I can the front side. 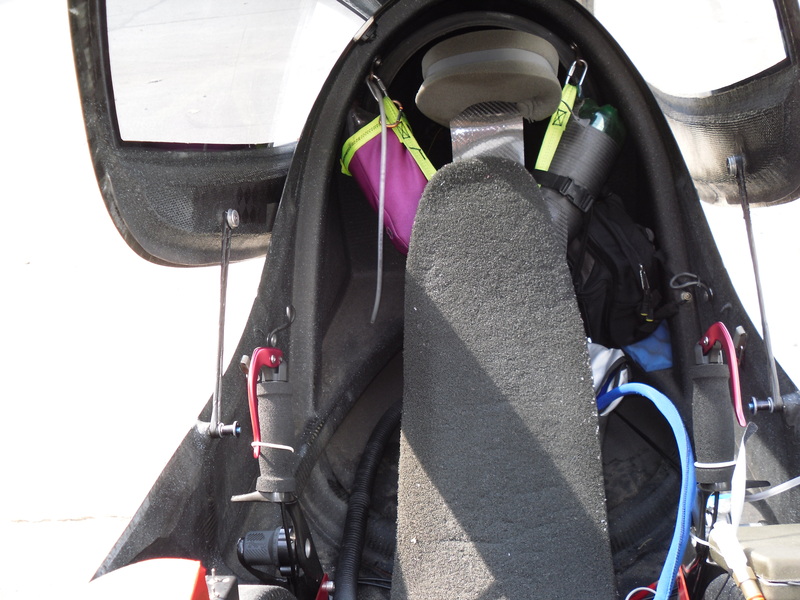 With the two board design everything will be a clean smooth surface with the weight inside out of the way. I can easily adjust the amount of weight according to how the rig performs. 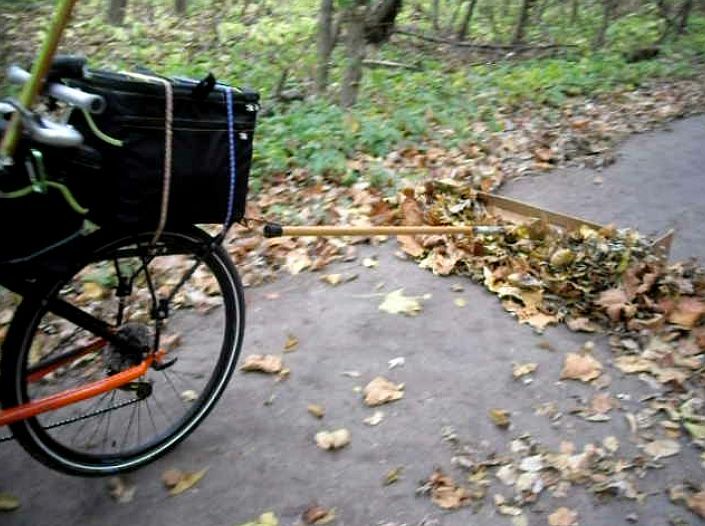 The idea is to keep the rig down on the trail surface so it isn’t allowing the leaves to pick it up and dump them out underneath of it. Of course, one doesn’t want any more weight back there than necessary since it makes a difference in how hard it is to pull it along. 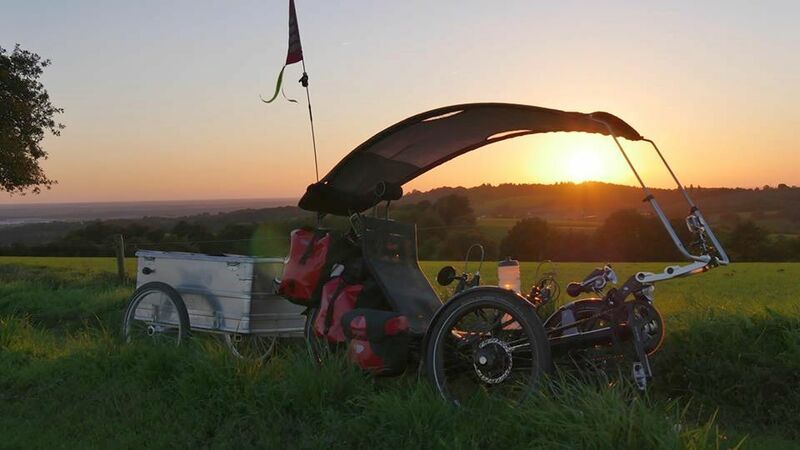 “At AZUB, we are very proud that an overwhelming majority of production process and assembly of our recumbents take place in the Czech Republic. The rest is done in the neighbouring Slovakia. From the first sketch, continuing with bending of tubes, welding until the last screw screwed up, we produce everything in the heart of Europe! 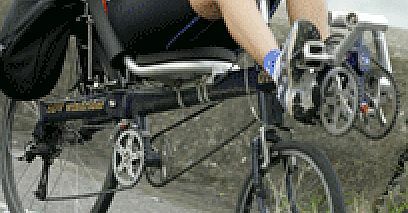 AZUB BIKE is known for building high quality custom recumbent bikes and trikes. 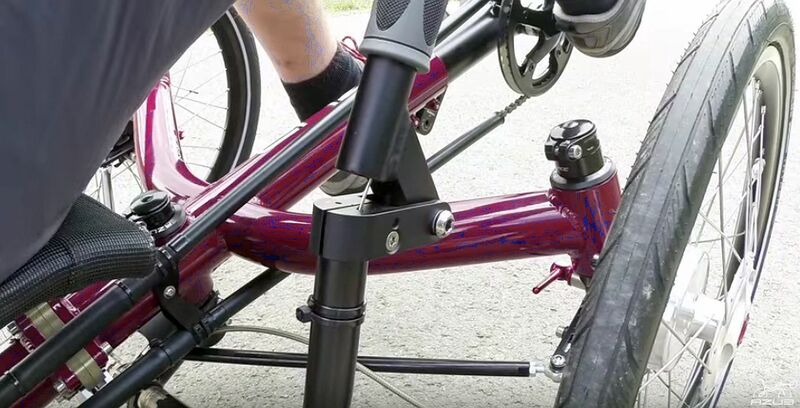 Among many customizations they have developed also the “push brakes” which allow disabled people to ride on bikes in case they do not have ability to operate regular brake levers. 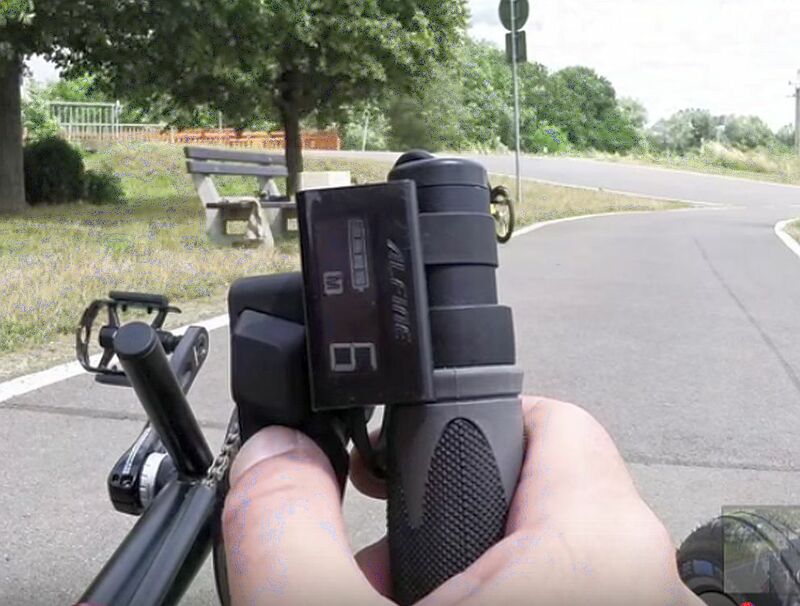 Azub also assemble Shimano Alfine 11 with electronic shifting for easy operation and they have a couple of other options and accessories for disabled riders as well. I went to their WEBSITE and searched for what they have to offer and came up empty handed. If it is on their website I don’t know how you locate it. A little closer look at some of the gear. 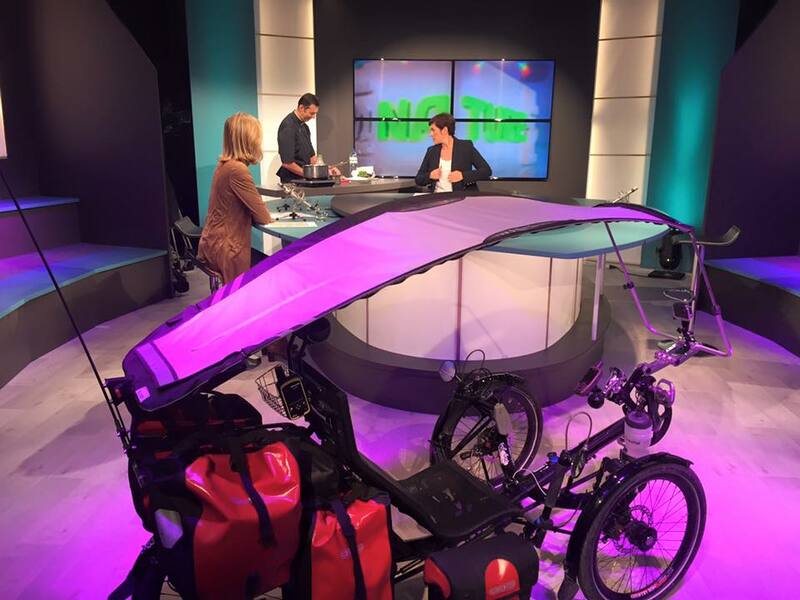 Television coverage certainly helps promote the adventure. There really is a place for everything and before heading out everything will be in its place. I don’t understand a word that is being said, but I can identify with the images of the trike and riding it. It looks like an enjoyable journey and I certainly wish him safety and great memories during and as a result of the adventure. 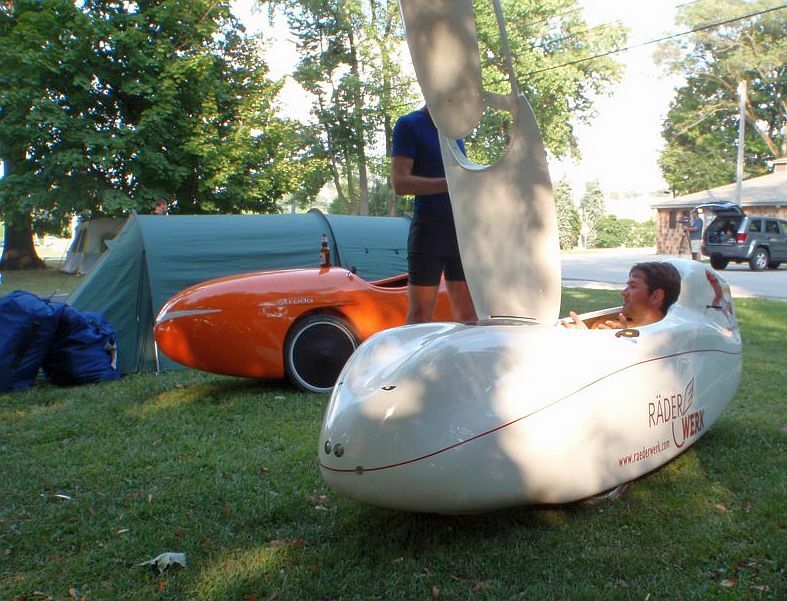 Gary Solomon of Laidback Bike Report and their crew attended the recent Recumbent Cycle-Con held near Cincinnati, Ohio. 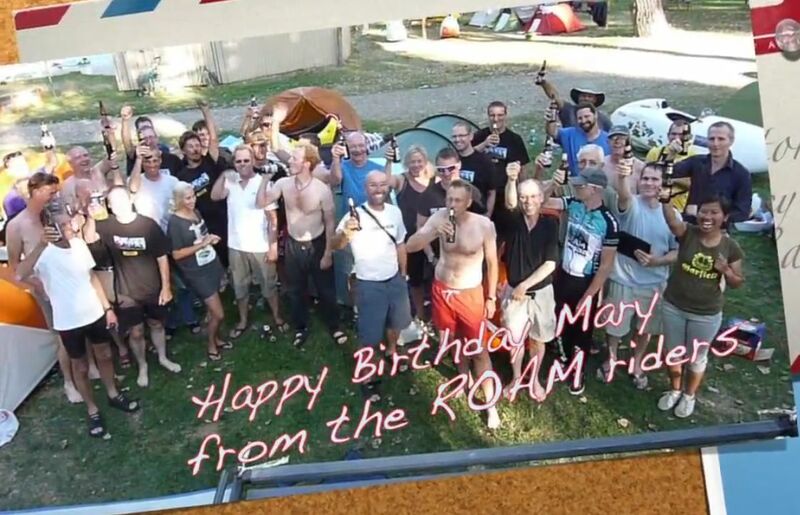 Here is a video of his time spent there interviewing various folks of the recumbent industry. 1:03:45 Laidback Bike Report Crew Wrap Up! Here are all of Gary’s YouTube channel videos. Laidback Bike Report started up earlier this year. It currently consists of 4 men from around the U.S. and 1 man in Germany. They are: Gary Solomon, Carl Kidd, Travis Prebble, Dennis Voorhees, and Lars Komm (Germany). You can read more about them HERE. 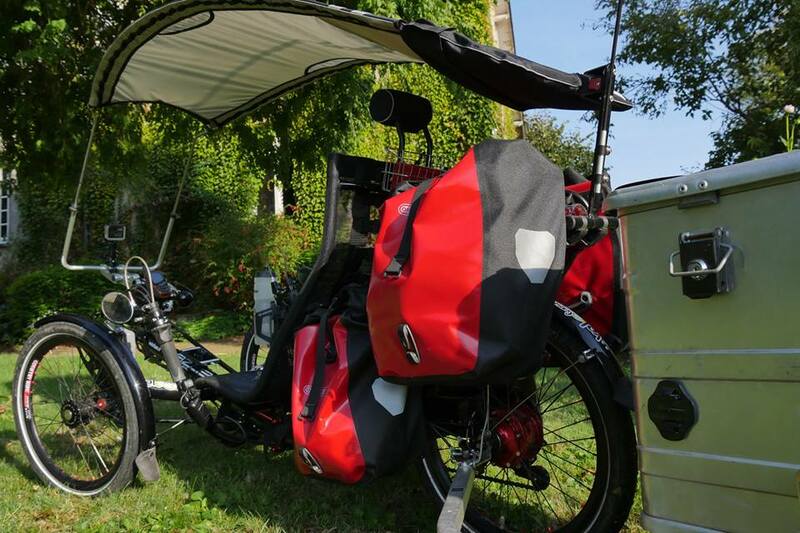 Each month Laidback Bike Report does a video interview with someone in regards to the recumbent world. You can view it live when it is scheduled and post a question to be answered live during the interview or a leave a comment. Their instructions on how to do this will be posted on their website prior to the live webcast. Apparently they don’t always have instructions posted. I just checked and there are none. The other day I found some which I am posting next. I have made minor alterations of rewording to have it apply to my posting it here on this blog … You can watch on Google+ HERE, YouTube HERE, or watch on their website. To comment on Google+ just leave a message on the Event Page. If you are watching on their website click on the YouTube logo at the bottom right of the viewer to go to YouTube where you can leave a comment or question. We will monitor these during the live webcast and bring them up to the person being interviewed. Of course, you can view their videos anytime once they post them, but only during the live webcast can you submit questions and comments to be addressed during the interviews. To aid us in knowing when scheduled as well as unscheduled broadcasts will occur we can sign up on a list to receive an email to inform and remind us. Just fill out the form on their website. 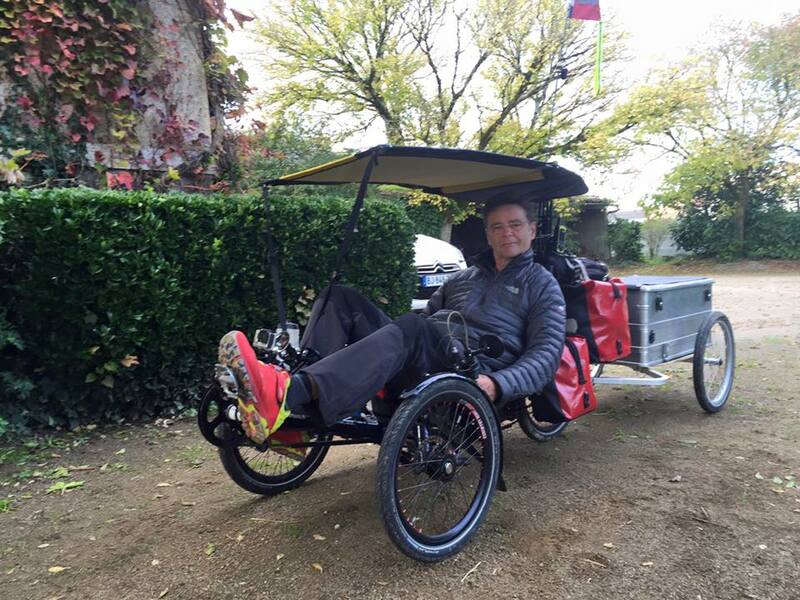 I just want to express my personal thank you and appreciation for this new “service” to those of us interested in recumbents. It is great having them make their reports. I look forward to viewing more from them in the future. 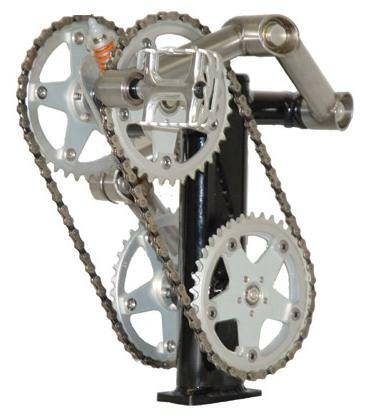 Borrowing from the article I linked to above this sentence somewhat sums up everything: “We think the geometry of SDV makes riders use larger muscles, giving lower cadences than we expected.” It makes sense that this system would work better than a conventional crankset. 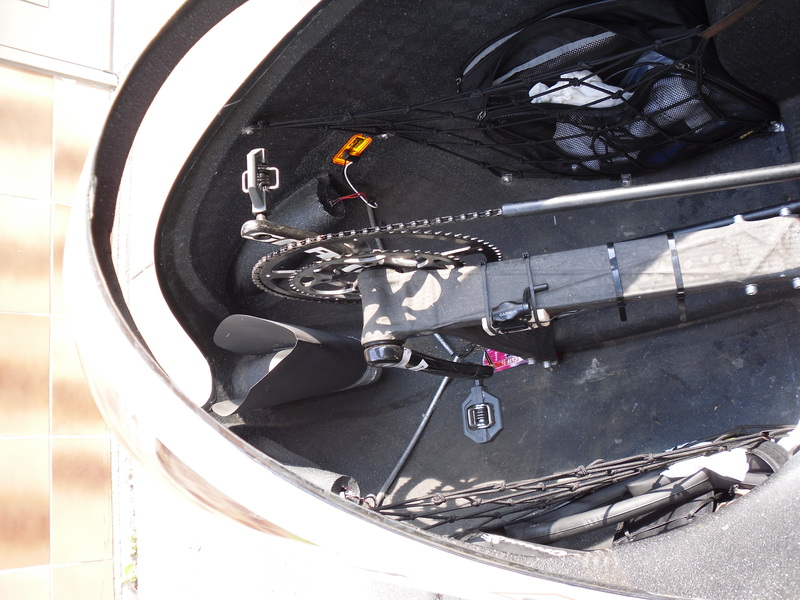 Of course, the positioning of the two sprockets would be different between a diamond frame bike/trike and a recumbent bike/trike since the legs are coming onto the pedals from different positioning … down from above on a diamond frame and forward from behind on a recumbent. In the image below I have drawn yellow lines showing the difference in the positioning of the sprockets between a DF bike and a recumbent. Both cycles are travelling in the same direction. I can’t find any online videos available to share here so if you want to see any you will have to download the files onto your computer like I did. I am unable to post them here in this blog like I do other videos. HERE is a link to a webpage where you can download the videos. The webpage is all messed up and difficult to figure out what is there as there is text on top of other text. You will have to click on the British flag in order to open up the next page and then click on Movie Theater to get to the video links. You can try using this LINK Using this link should start downloading the video unto your computer. It is a WMP (Windows Media Player) format. Personally I would not bother even looking at any of the other videos as they are either the same thing, but not as good of quality or not much to see. HERE is a website page where you can read about the technical aspects of this drive. HERE is a .PDF file on this innovative design. It is quite technical so it probably isn’t of much interest to the average reader of this blog. And HERE is one of the better webpages I have found on this drive system. 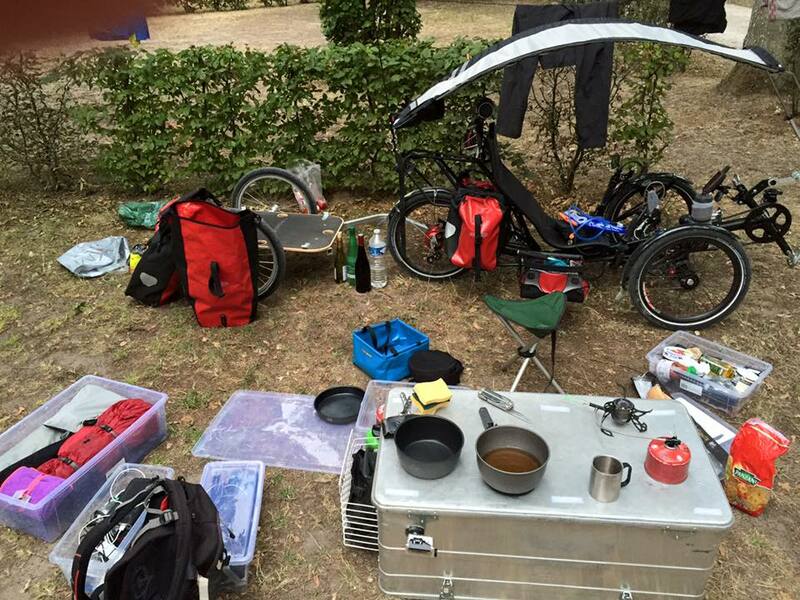 Here is a video with Gary Solomon of the Laidback Bike Report interviewing Rolf Garthus. Rolf and his wife, Barb, are the owners of the Hostel Shoppe in Stevens Point, Wisconsin. 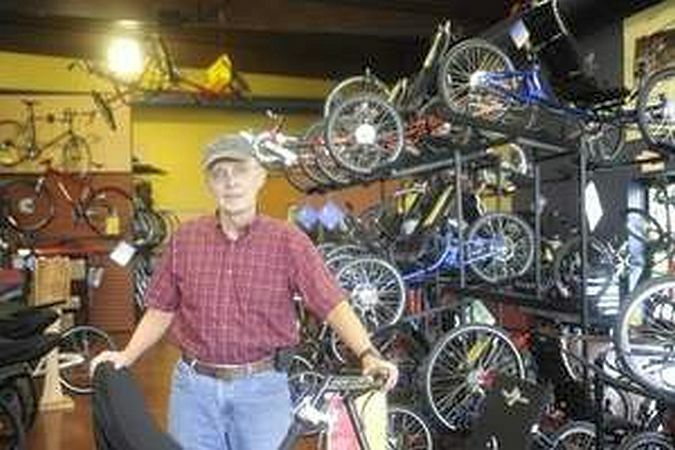 Hostel Shoppe is reported to be possibly the largest recumbent sales business in the U.S. The Hostel Shoppe also hosts the annual Midwest Recumbent Rally. 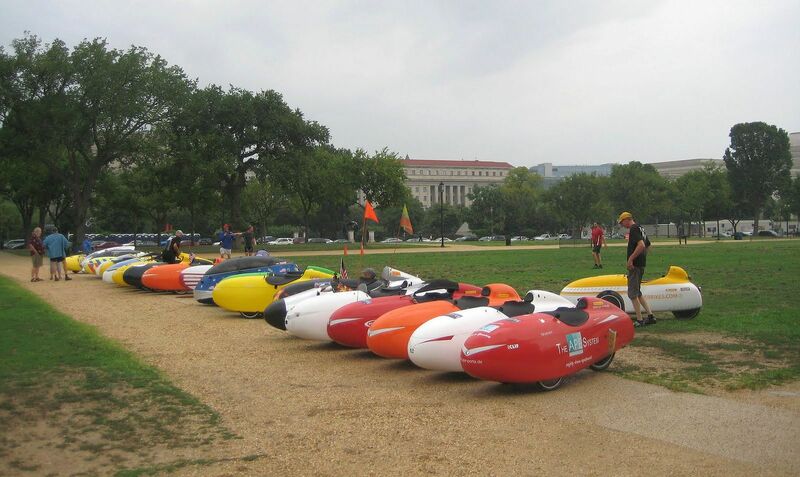 I really enjoyed listening to him tell about how and why he got into recumbents and especially tadpole trikes. He shares about how the Hostel Shoppe business was started and its history. And he shares about several other things of interest to those who have an interest in tadpole trikes. 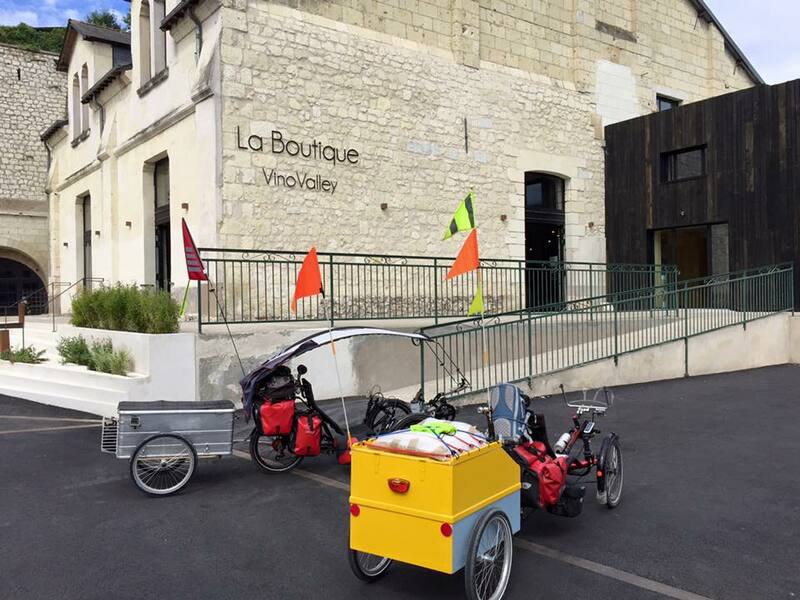 Rolf reports that they sell 3 to 4 more recumbent trikes than they do recumbent bikes. I have heard this before from other sources. Rolf is in his 70s now which has brought on some physical changes and limitations as aging does for most of us. Never the less he is still actively riding and attests to the comfort and joy of riding a tadpole trike. Here are a few somewhat unique videos showing some homemade side by side tandem tadpole trikes as this family travels along on them. 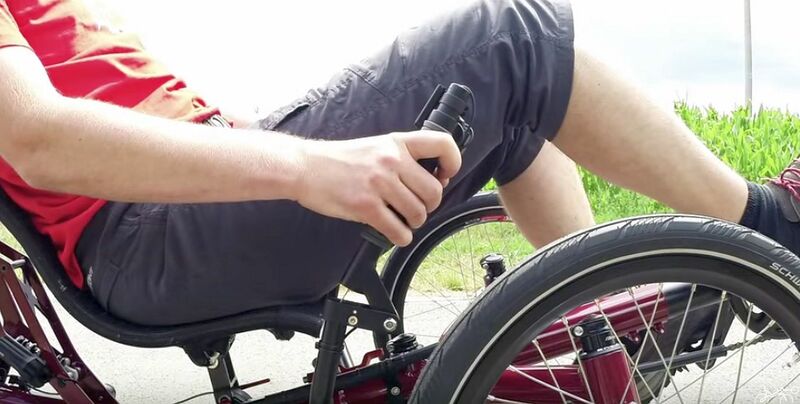 And here is a video showing the assembly of the adult trike. Here are the two boys riding along on their side by side tandem trike. Here is a short video showing some of the detail of the kids’ trike. And if you enjoy watching these videos HERE is a link to all the other YouTube videos by this person. A video of an organized ride in Vicksburg, Mississippi. 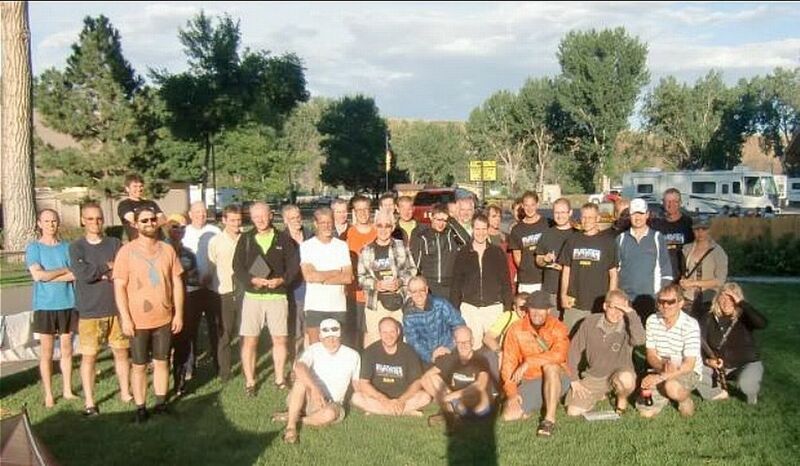 It looks like the participants had fun. 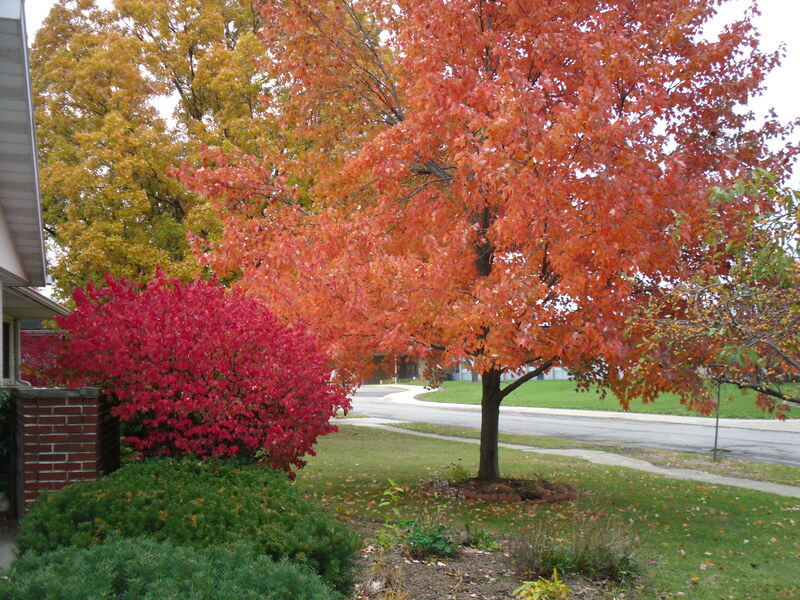 I have red maple and red oak trees and burning bushes. 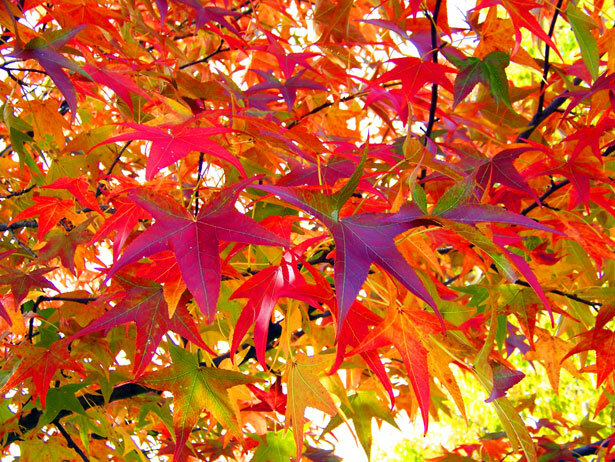 Still there are so many beautiful trees, bushes, shrubs, etc. out there to behold beyond my front yard and I really enjoy getting out there each Fall and seeing them. One of the best ways to do this is by riding my tadpole trike. 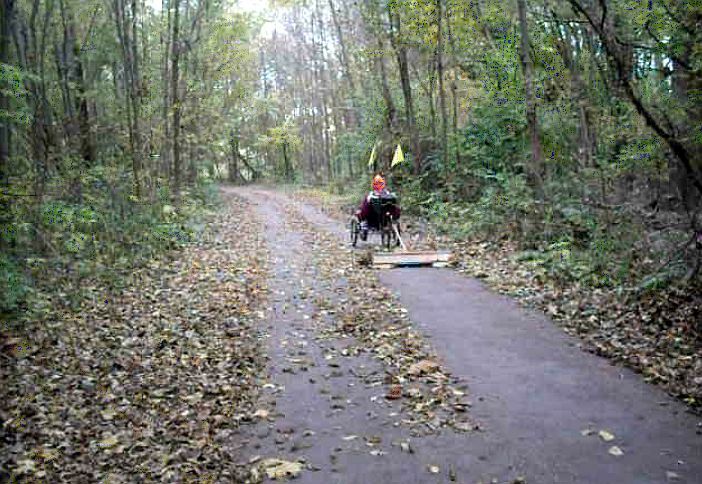 Riding along a trail or road covered with leaves can be challenging and a bit dangerous as one can not see the edge of the pavement and can easily ride off it and get into trouble, especially if there is a drop off. That can be really dangerous on a bicycle. Fortunately on a tadpole trike it is a bit safer. Never the less we need to be careful how we handle the situation or we could find ourselves over on our side or even upside down in some of those leaves or anything else that might be off to the side of the trail. So if you find yourself riding along and suddenly your front wheel goes off of the edge of the pavement be careful when you attempt to get back up onto the pavement. I already touched on the subject of tipping over. Besides that you can damage your tire if things go wrong. And some tires damage more easily than others depending upon how they are made and the material they are made of. 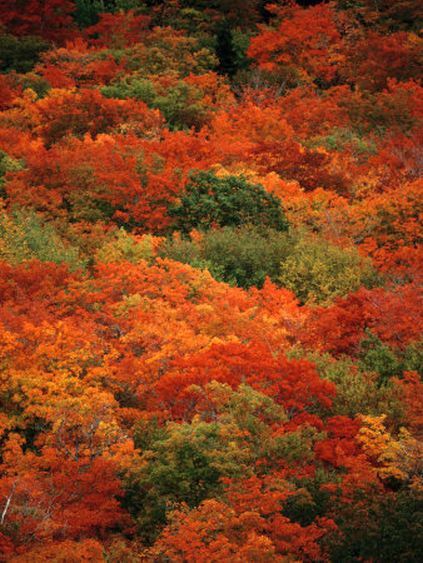 … while the views off to the sides of both trails and roads can be breathtaking. As awesome as it all is be safe out there. 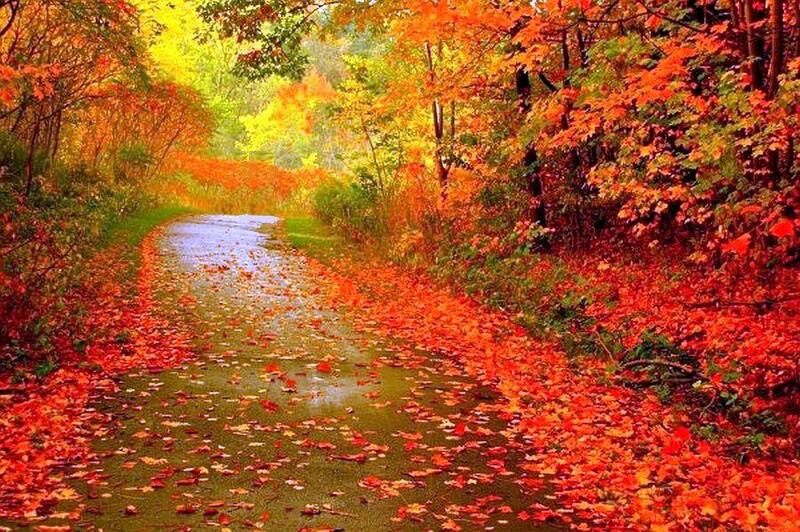 Don’t get so caught up in taking in all that beauty that you do something careless which results in an accident. If there is a safe place to stop and take it all in that would be the safest way to go about it. 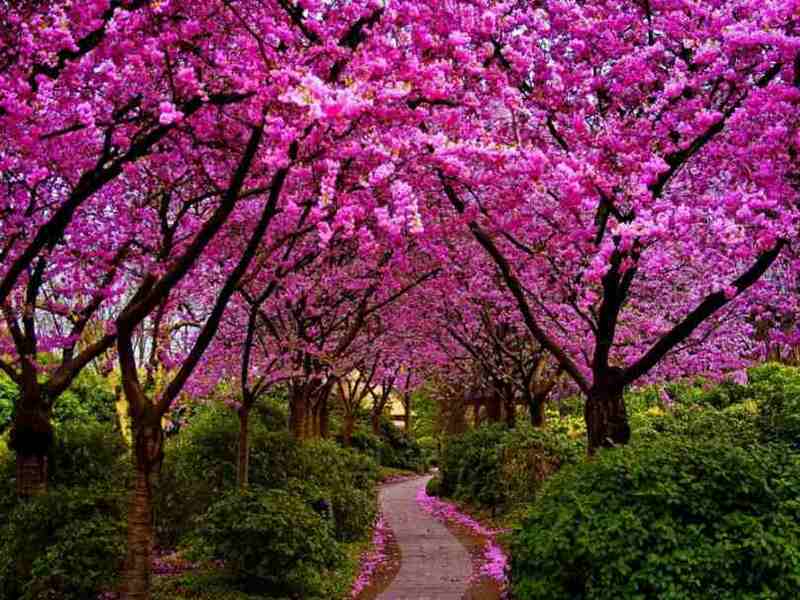 Only God can create such awesome beauty and it is so important that we recognize this and give Him the praise, thanksgiving and glory due Him alone. As I ride along one of these enticing trails I like having communion with my Creator and telling Him how awesome He is. 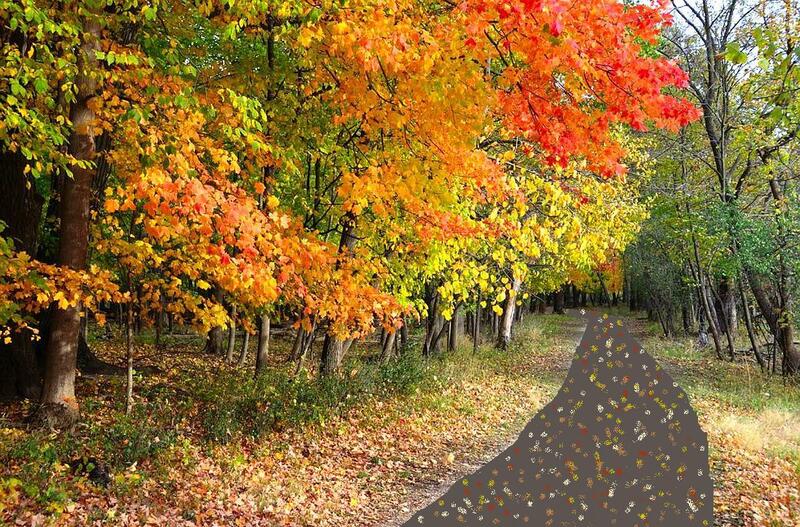 If you don’t happen to live in a place where you have this beautiful annual transformation of the seasons in some ways I feel sorry for you. But then again you probably don’t have what follows this awesome beauty to contend with either. 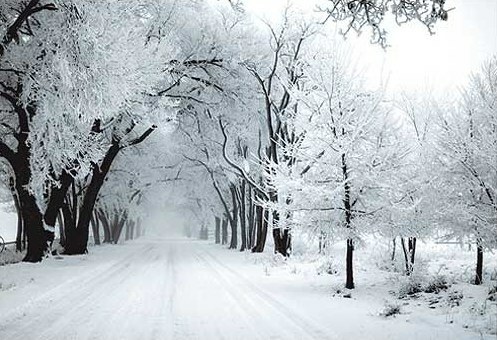 It too can be very pretty, but it is not so pleasant to be out in it, especially when it is bitter cold and the snow is wet and deep. It is at this time I am somewhat envious of those who don’t deal with these four seasons.